I have been using Infolinks on my MBA Forum for quite sometime now and so let me share with you my views reviews and experience about Infolinks. Infolinks is CPC based contextual advertising network that offers In Text advertising also known as InLinks or ContentLinks. Ads are integrated within the content and so no additional space is required to display ads. As always I start with the negatives and this time it will be no difference. Low Per Click Earnings – If you compare Infolinks with Adsense then Infolinks has a very low per click earnings. We are here comparing apples with oranges but when both of them are CPC based advertising networks comparison is inevitable. Unrelated Ads – Time and again I see ads which are not close to keywords. 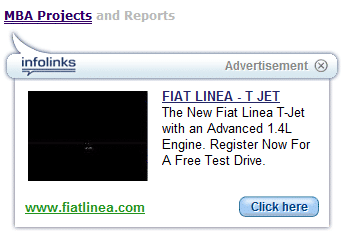 On my MBA Forum I see ads related to cars for keyword MBA Projects. Global Inventory – The best part of Infolinks is they have a very good Global Inventory. MBA Forum is mainly Indian centric and Infolinks works much better than Kontera. Kontera’s recent product Kontera Synapse – where they don’t show ads if they think user is not likely to click actually means they have lesser inventory to fill. My Kontera earnings decreased by almost 50% in past that product launch news and when I contacted them it was not very positive. Adds to overall income without any banner space – Inline ads never take up any banner space and so you are never concerned about the placement and it adds well to the revenue. Intext links has never been a major source of income for me (See the break up here) but it adds to the final total. Apart from that I follow couple of rules for inline text advertising. I only show inline ads to guests and not to members. This gives me an added advantage to ask guests to register. I only show inline ads within the content and not everywhere in headers and footers. I find it very unprofessional and also on forums I make sure the ads only appear on the thread pages and not on home page or forum/sub-forum pages. Innovative Products – Infolinks have been very innovative with new products and their latest product – Related Tags works really well. The only problem is they don’t have reports to judge how this product is working but increase in earnings after installing Related Tags suggests it is working. Pays with PayPal & Payoneer – Infolinks supports PayPal but recent PayPal issues in India & they soon started supporting Payoneer prepaid debit card (More about Payoneer here). Payoneer is great for publishers in India who wants to keep their business out of PayPal. Good CTR – I have seen far better CTR for Infolinks then in kontera. 5 to 7 times better in CTR than Kontera and this compensates very well for low per click value and brings the eCPM higher. Works with Adsense – InText links not only are banner space independent but also works with Adsense TOS and apart from that I have not seen any decline in my Adsense CTR or earnings after using infolinks. Extra income is not bad at all. Highest Revenue Share – Infolinks offers highest revenue share in the industry i.e 70%. It is even better than Adsense which is at 68% and many other in-text ad providers give only 40% to 50%. Infolinks has Much Better Support than Kontera – When Indians had problems with PayPal, I was using Kontera as well as Infolinks and Infolinks reacted very early to email about the updates and steps they will take to solve the issues with PayPal refunds, where as Kontera did not even respond to the support tickets for 15 days and once I posted this on Facebook they looked into it. I have been using Infolinks for couple of years now and yet I have very less negative points to share then positives. Apart from that I think Infolinks works better for majority of people because they have great CTR and world wide ad inventory and so if you still have not given them a try go Signup Now. If you are already using Infolinks share your experience in comments below. Could not get your question. What did I integrate? – Are you asking how I integrated Infolinks? Thanks for the review. I have started implementing infolinks on my blog after your review. Thanks for the great info. I think there’s only one more issue to be solved. Infolinks ads do not open in new window and there’s no way can be enable from your Infolinks account. This had made some of my guests navigate away from my site and not return. This is the only negative thing I see in Infolinks. I would agree with you on this. InfoLinks is great in every other aspect. Inability to make ads open in new window is the only thing that prevents it from being the best In-Text Ads Site. Hi, My Blog has been approved by Infolinks in last month, but i was scared to implement the code of infolinks in my blog. after the review, i am definetely going to add infolinks code. Glad to see that the review helped you but may I ask what was scaring you to implement infolinks? No I have not seen any such issues with any of the InContent text links because they load the ads asynchronously and after all elements are loaded. It was a concern few years ago but not any more. Thats Great… and 1 more thing i want to know. does infolinks pay for Impressions also? As far as their site says they pay on CPC based payment model. Hello Unni, Infolinks does not effect how quickly your website will load. But maybe there is a problem in the placement of the code. Contact us at support@infolinks.com. Tammy, great to see your support. Iâ€™ve really enjoyed reading your articles. You obviously know what you are talking about! Your site is so easy to navigate too, Iâ€™ve bookmarked it in my favourites. . . . . Fantastic website I will bookmark it and come back later. hopefully what you give can be useful for me and many people through the post that you provide. Every major InLine Advertising Network have read this review. Really nice one. Hi â€“ I work for Vibrant Media. Iâ€™d be happy to talk to publishers interested in joining our in-text network. Â We offer the leading technology as well as the most relevant, most premium, and highest paying ads.Â You can reach me via email at accountmgmt@vibrantmedia.com. Iâ€™ll reply within 1 business day. I have dropped an Email to you. Let me know your thoughts. This is Jonathan from Kontera. I reviewed your past correspondences with Kontera, and I think the problems last February had more to do with changes with PayPal, rather than an error with our Support Team. However if there’s something we miscommunicated, I apologize. It looks like we sent you your December and January earnings on March 3rd, which given the challenges PayPal created was the earliest possible date we could get that to you. In terms of our Synapse engine, while it’s true we put a high premium on relevancy (targeted ads are more attractive to advertisers and lead to higher CPC for publishers), if you contact Kontera, we can have adjust the settings both of how relevant your ads are and how many In-Text ads appear per page on your site. While we’ve found that fewer In-Texts ads with highly relevant placement is the most effective formula for publishers, you’re certainly more than welcome to experiment in that area. Regarding our ad inventory, it’s really second to none. We feature an exclusive ad inventory from some of the biggest brand names in the world including Blackberry, Pizza Hut, Nintendo, Microsoft, National Geographic, Ford, Toyota, HP, and many more. These premium, often rich-media ads are the most attractive to site visitors, offer the best possible CPC, and can only be found on the Kontera network. Additionally, we currently offer new publishers a 70% revenue share and a $50 bonus to any new publisher who gets at least 25,000 U.S. page views during their first 30 days on the network. Please feel free to contact me if you’d like to discuss what Kontera can currently offer for you. Hi Jonathan, Thanks for comments. 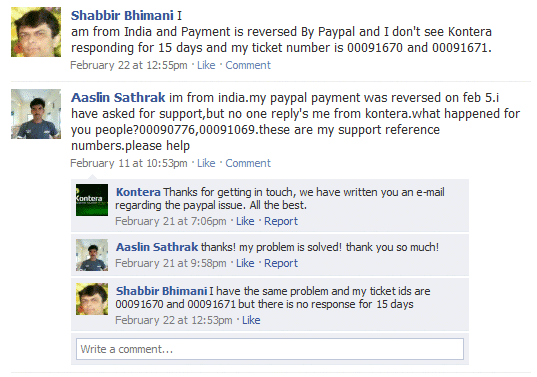 I am not talking about PayPal issues but what I am talking about is Kontera support – I did not see any response for the tickets for 15 days after which I posted on Facebook. If you browse this blog you will see that I was aware of the PayPal issue and so was not wanting to be doing lot of things in those 15 days anyway but don’t we expect a reply as to we are working. I got similar reply to the queries on 22nd Feb or there about that Kontera will re-issue the payments when things will settle down in PayPal. This could have been in few days after the tickets and not after 15 days. Tell me if I am wrong here. Regarding Synapse when I saw decline in earnings I emailed support but without anything positive. You can see my account to see the drop in earnings for yourself. Emailing did not help and so I never added other sites to Kontera. I am not doubting your ad inventory but on sites with no US traffic there is hardly any revenues generated out of Kontera. You could again see in my account that we had a MBAGuys site before in Kontera but due very low earnings I had to get it removed after a notice period of 60 days of having the code on the site. Again the notice period is of big concern from Kontera. If I want to experiment Kontera on any site I cannot use other Ad network unless I give 60 days of notice period and so I am experimenting very less with Kontera or you can say absolutely no experimentation with Kontera. I will be more than happy to discuss things. Hey, this is Tammy from Infolinks. Thanks for the great review 🙂 If you ever have any questions, please feel free to contact us at support@infolinks.com. I never knew that we have an alternative to Kontera and I was really looking for something like this. I am heading towards them and I hope they don’t have very strict rules for new publisher acceptance. No a good quality content site is fine and they don’t have very high traffic requirements and so I think it should be fine for majority of bloggers.